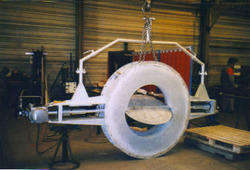 Our range of products include high temperature dampers. We feel immense happiness to introduce ourselves as the industry’s leading organization engaged in offering a premium quality range of Forged Die Steel that is extensively used in different sectors of industries such as construction, chemical, petrochemical and pipe and fitting industries. This Forged Die Steel is manufactured by making use of excellent quality steel and modern manufacturing techniques under the strict vigilance of our adept professionals. As per the specific needs of clients, this Forged Die Steel comes in varied thicknesses and dimensions. Looking for High Temperature Dampers ?